Starting in 2012, the RISD community set out on a master plan process in support of the college’s 2012-2017 Strategic Plan. Rather than taking a 20th century approach to master planning, developing a static list of projects, RISD chose to develop a set of dynamic and responsive tools calibrated to sustain long-term core values, principles and policies. This master plan was designed to persist through future changes in leadership, economic variability, and pedagogical and technological advances. This website provides foundational information about the master plan, its guiding principles, ongoing structures and projects, as well as opportunities to be involved. This strategic plan serves as a guide for RISD over the next five years. It presents our vision of how RISD can best educate and support artists and designers for a changing world in ways that respect our founding ideals and reflect who we are as an institution. This strategic plan makes a commitment to a model of art and design education that is immersive, discipline-based and grounded in studio practice. RISD’s education excels by nurturing creativity and innovation through rigorous, deep disciplinary learning and engagement in the practice of art and design. To learn more about the genesis of RISD’s strategic plan you can click here (you will leave the Master Plan website). 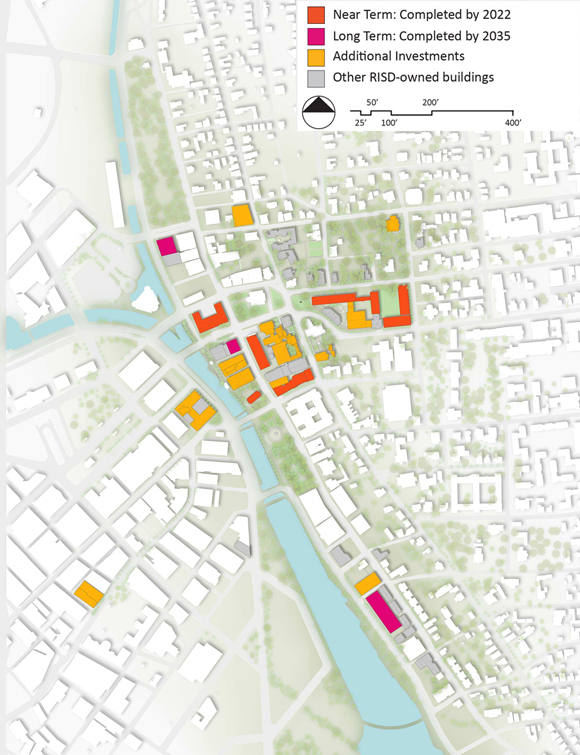 This map shows the near-term initiatives and the long-term opportunities of the 2015 Master Plan. Click on the image to visit the interactive map. You may also download the file (152 mb/.ai format).